TechRadar has arrived at CES 2018 this week, and that really isn't news. 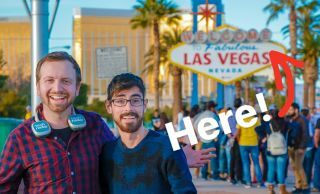 How we got here, however, is rather extraordinary: Nick Pino and Matt Swider took an epic, week-long road trip to attend CES, and they brought a bunch of gadgets to test along the way – everything from a foldable phone to 4K-capable drone. Future's brand new New York City office was the official starting line. CES is the finish line, with seven days on the road in between. Stops included Washington, D.C.; Knoxville, Tennessee; Memphis, Tennessee (it's a long state), Oklahoma (the middle of the country); a lunch-time pit-stop in Amarillo, Texas; Santa Fe, New Mexico; and Monument Valley, Arizona (which is in almost every Western you've ever seen). And here's Episode 3, the final installment of the CES 2018 Road Trip staring the ZTE Axon M and a Boosted Board 2 electric skateboard. The first leg of our adventure to get to CES in Las Vegas involved traveling from a hungover Manhattan, which had just celebrated New Year's Eve 2018, to the the nation's capital, Washington, D.C. But the further West we got, the more scenic the road trip became. Here's what the TechRadar team has experienced during the road to CES 2018. We took four different phones with us to CES 2018, all for different reasons. The first is a foldable phone, the ZTE Axon M, which may be the future of the smartphone. It's the first modern smartphone to fold in half and, full disclosure, ZTE helped sponsor TechRadar's travel across America for CES. The foldable phone era is about to begin, with Samsung rumored to be following the new trend in 2018 and even Apple patents hinting at a bendable iPhone in the distant future. Early adopters should get ready for more changes beyond an all-screen smartphone. That was just the beginning. How does it match up against the Google Pixel 2 and iPhone X? We tested that out in the video below. We've also brought the original iPhone 1 with us to show how far phones (and, specifically, the camera) has advanced in ten years. With a six hour drive (seven-and-a-half with stops to eat and gas up), we're now in Las Vegas, collected our CES badges and completed our road trip. Hurray! What awaits us is... more work. But that's only good news for you because we're now bringing CES 2018 news and announcements to you every day. Have questions on what's hot on the CES show floor? Follow and ask Matt Swider and Nick Pino on Twitter. We'll answer your questions. Here's our video of the drone launch in Monument Valley, which we did just after sunrise – on the way to CES 2018. Yes, we almost got run over by a car doing it. You expected a less dramatic ending from us? Loading and unloading the roomy Genesis G80 Sport is a Herculean task. That's because we have so much tech with us. We have started to refer to putting our suitcases in the car truck as "Tetrising." We even hum the Russian music. We're now approaching Monument Valley, which you've seen in almost every Western scene in a movie or TV show, from John Wayne films to Road Runner cartoons. Most of today, however, was spent driving, so we're headed there tomorrow. In the meantime, we're showing you what's on our gear list for CES 2018, right before we unpack it and start using it on the show floor. We found out we needed more tech during our travel from Oklahoma City to Santa Fe, New Mexico today. Specifically, a radar detector. We were pulled over for speeding ever so slightly in the Sooner State – we couldn't wait to say 'Later' to the Sooner State after that experience. What's the rush? This is our longest leg of the trip: 8 hours of driving, and that's without stops. It'll take us at least 10 hours to get to our destination. On the bright side, we were able to eat at the famous Big Texan Steak Ranch in the middle of I-40 in Amarillo, Texas, and we talked about Texas-sized CES 2018 predictions. What do we think will be there? Matt and Nick dissect the show in the vlog below. We're halfway through our CES 2018 road trip today, rolling through Memphis, Tennessee, the "Home of the Blues" and the birthplace of Rock 'n Roll. What better time to retool our playlists? And being tech-savvy folks, we all have different platforms: Google Play Music, Spotify, and Tidal. That's been two tech editors and a videographer. What attracted us to our respective music apps? "I wanted to hear the new JZ album and I ended up keeping Tidal," said Paul Encinas, our videographer. Clearly Tidal's exclusivity angle works. Though it pays $10 a month, not the pricey $20 a month for the high-def FLAC version. "I love the social component of it," said Nick Pino. "It's great top see what my friends are listening to. That's how I find a lot of my new music." "I would have Spotify, but instead I went with Google Play Music," replied Matt Swider. "I always meant to cancel it and switch to Spotify. But then YouTube Red (which rids YouTube of ads) convinced me to keep it." What does Knoxville have to do with CES? Well, besides a natural hotel stop in our long journey across America, it hosted the 1982 World's Fair. That's an important connection because, as we learned on our road trip, this particular World's Fair saw the birth of the touch screen. Think of all of the CES gadgets that make use of the touch screens today. This is where it all started and was first shown off to the world. What remains of the 1982 World's Fair is an iconic 266ft (81m) high shimmering gold-colored Sunsphere. Here's Matt and Nick talking about the gadgets they brought across the US and what we're looking forward to at CES 2018. Just how frozen was Day 2 of our road trip to CES 2018? Well, we were able to walk across the iconic Lincoln Memorial Reflecting Pool. Yes, we've began our road trip by literally walking on water. We are that amazing, right? Also, there was a sign that specifically told people the frozen block of us may be unsafe. Which, naturally, was an invitation to stand on said ice. We were told that it's about 18 inches (46 cm) deep along the perimeter, so we felt safe enough. We got to take photos – with various smartphones – of Mr. Lincoln. We didn't get the same opportunity to take pictures with President Trump. Twitter said he was busy. The first 24 hours on the road to CES ended with us headed further south, toward Knoxville, Tennessee. Time to break out the Chicken and Waffles. Las Vegas is in our sights. New crisis! ...It did snow in the days leading up to our Manhattan escape. And the entire East Coast is about to suffer from a "Bomb Cyclone" storm. We still managed to make it out of a frigid Manhattan in one piece in a car that's not our own. Another crisis adverted. Our first big hurdles of attending CES 2018 via a cross-country road trip were over and done with. Five hours later, we ended up in an equally frozen Washington, D.C. And, with a little sleep, we tested out some smartphone cameras to take photos of the famous monuments. This is the car we've driving to CES 2018. It's the latest Genesis G80 Sport courtesy of Genesis, and it's our amazing ride for the next seven days. It's $57,750 (about £42,480, AU$73,946) and it drives like a dream. At first Nick and I were worried because it's the first time either of us drove in Manhattan (I just moved here, after all), and we've be doing it in a bigger car than we're used to. Well, the larger interior of the G80 Sport doesn't really translate to a "boat," like everyone has told us in the weeks prior to today. It's also filled with enough sensors and safety features to keep us free from dinging anyone in Manhattan. Crisis adverted, right? Well... just wait until you see what awaits us on Day 1. TechRadar’s The Road to the Show 2018 sees our intrepid writers braving a cross-country trip across the US, using the best gadgets to bring you their daily travel blog and offering the best tips for a tech-based roadtrip. The journeyis brought to you in association with ZTE and the ZTE Axon M, with car transportation provided by Genesis.